You very well might work for a radar company if you found this page; at your next holiday party, ask the DJ to cue up a radar song, then watch the dance floor magically fill in, these are classics. If you serve in the military, play one on your next bombing mission when you're carrying anti-radiation missiles, and share the love! We've include the lyrics so you can sing along. Did you know there was once a UK record label "Radar Records?" 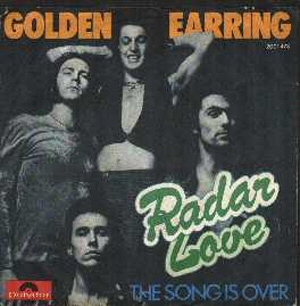 Radar Love was a hit song in 1973 by Dutch group Golden Earring. Read the Radar Love story on Wikipedia. What the heck is that, a man bra? Sung by Nena, most of the readers will remember this song as Ninety Nine Red Balloons. This protest song was written in 1983, about Cold-War military radar mistaking balloons for something else. Originally in German, the song was re-written in English in 1984; note that the English song was never meant to be a direct translation. Read both sets of lyrics here. Und hier someone has translated the original lyrics into English. "Nena" was born Gabriele Susanne Kerner in 1960. "Niña" is Spanish for little girl, a nickname she acquired while on vacation in Spain at age three. If you work in radar, everyone knows that "birdie" is the word for a spurious signal in your receiver. Of course, satellites are referred to as "birds", so if you work in space systems, one of the songs you need to request at your holiday party is obvious. Bird is the Word was a hit for the doo-wop group The Rivingtons in 1962. The Rivington's distinctive hats have hopefully been preserved in a doo-wop museum somewhere. Bird is the Word was adapted from an earlier hit Rivington's hit, Papa Oom-Mow-Mow, dating from 1962. In the video below of the Steve Allen show, first you will meet the Flying Wheels, a wheelchair basketball team, brought to you by spinal chord injuries from the exploding ordinance of World War II. Then the Rivingtons sing Papa Oom Mow Mow live, and it is not lip-synched and worth the wait. The Ramones did a cover of Surfin' Bird on the Rocket to Russia album and it became a standard for their live show. If you were born before 1970 and missed the Ramones in concert, your life went horribly wrong. Imagine a 1970's rock act without the masturbatory guitar solo and you will be on the right track. Surfin' Bird is three chord rock with the IV and V chords used very sparingly, it is a perfect fit for The Ramones. 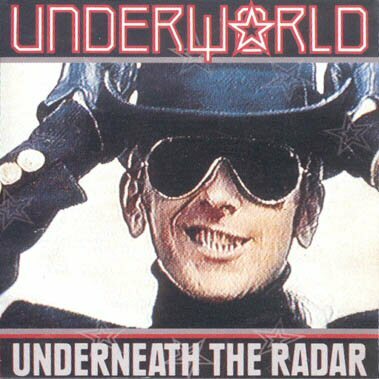 Underworld is a British pop group that dates back to 1980. Their Underneath the Radar reached #74 in the Billboard Hot 100 back in '88, and was featured on the television show Miami Vice. More recently, Underworld had some work at the London Olympics opening ceremony in 2012. Read about Underworld on Wikipedia. Why did everyone in the 1970s look like they just came from a leather bar? Did something fall? Well hey, what is the point in losin' sleep about it? Drop my love on you you you you you ... I'm gonna WO-O-O-O-O ya all - Watch out! Ha! More Solid Gold, brought to you my Microwaves101.com.